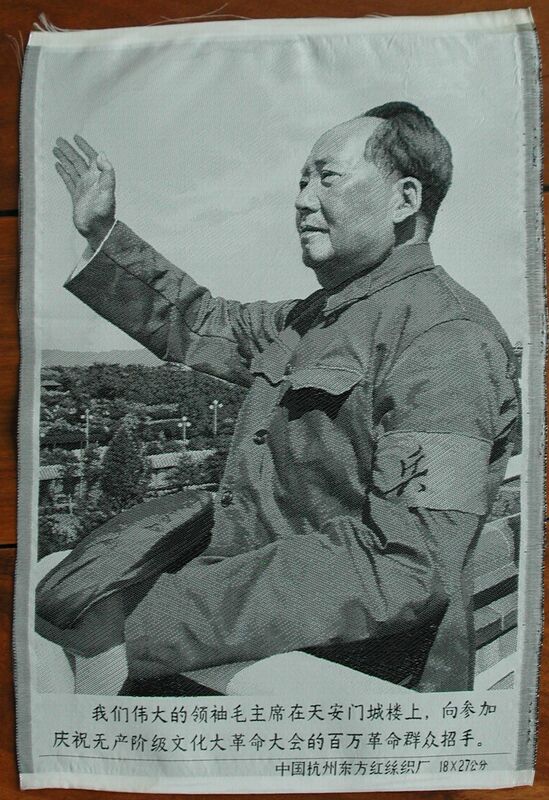 A good quality Cultural Revolution era silk brocade of Chairman Mao. 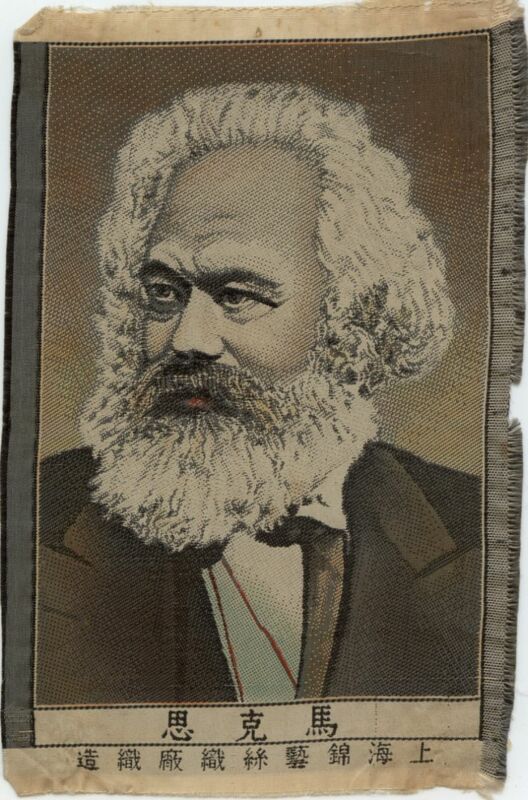 This silk is 49 cm x 72 cm as marked in the bottom right hand corner. Made in Hangzhou is Southern China. 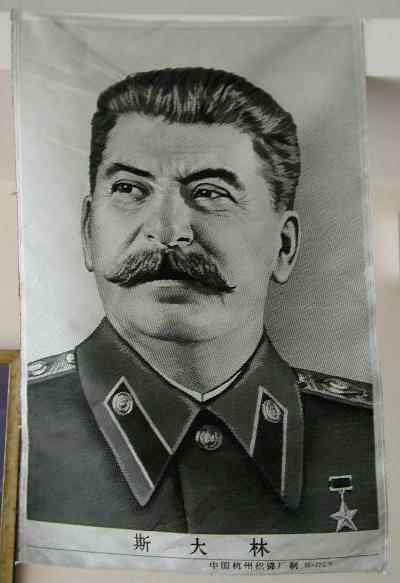 China made tributes to all communist heros of the world, Stalin was one. 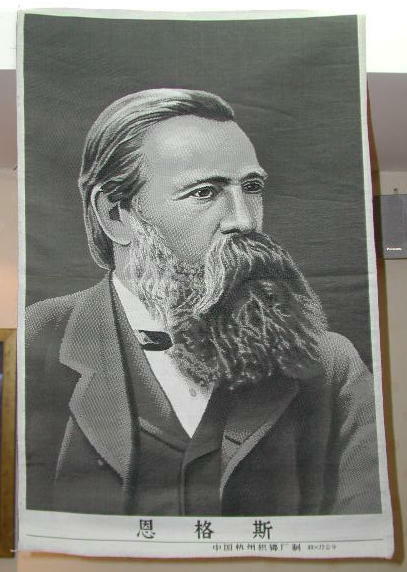 The size as marked is 49 cm x 72 cm, made in Hangzhou in Southern China. 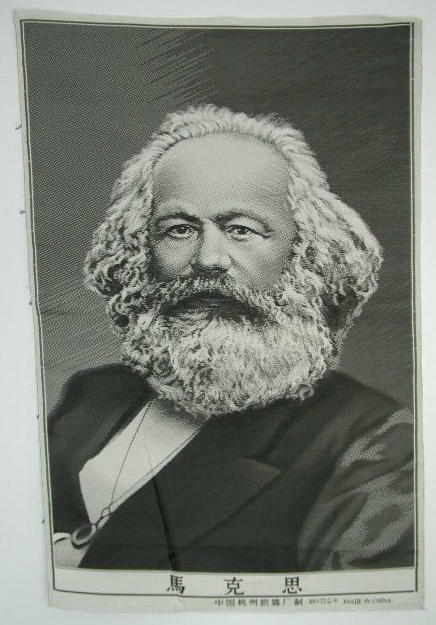 Famous for his literary works and a hero in the communist world. The size as marked is 49 cm x 72 cm, made in Hangzhou in Southern China. 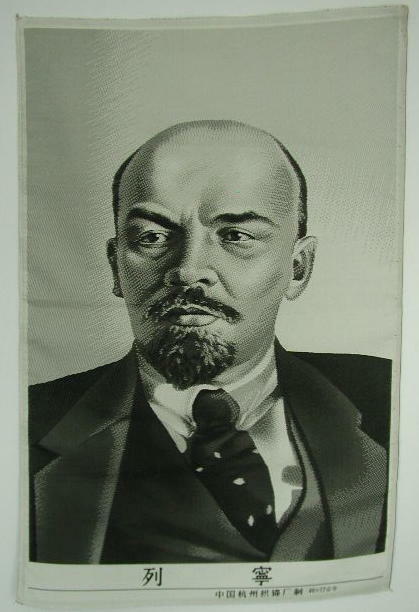 The leader of the Russian revolution and the glory of the Soviet Union. The size as marked is 49 cm x 72 cm, made in Hangzhou in Southern China. 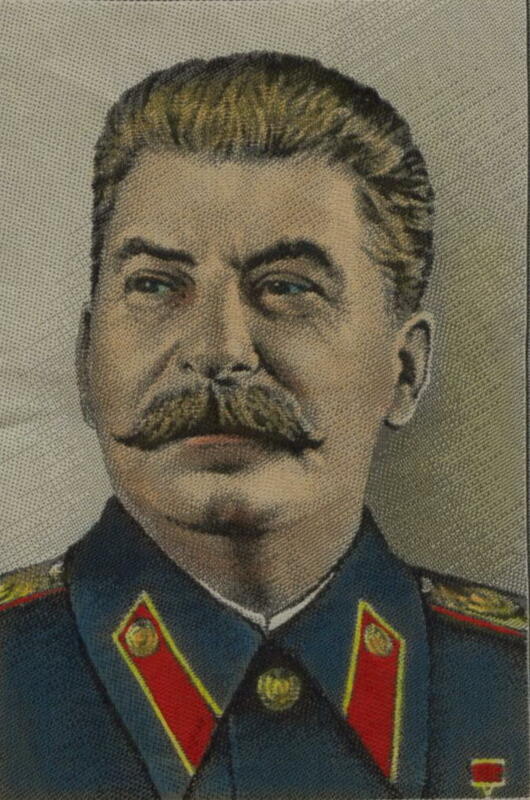 THE man of the written word behind the Iron Curtain. The size as marked is 49 cm x 72 cm, made in Hangzhou in Southern China. 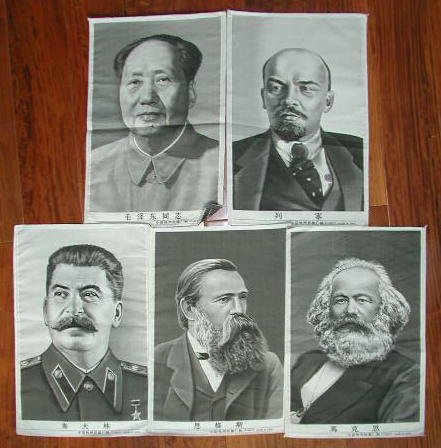 The five fathers together, Mao, Stalin, Lenin, Engels, and Marx. Each silk as marked is 49 cm x 72 cm, made in Hangzhou in Southern China. 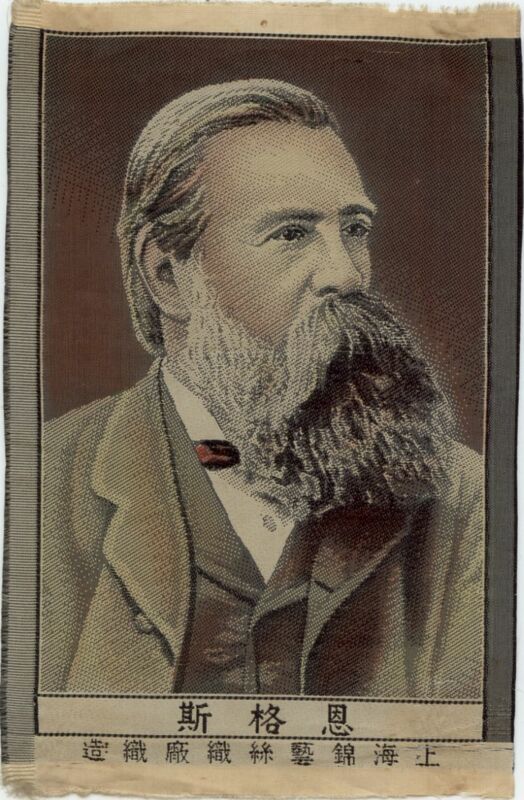 These two hand painted silk pictures of Karl Marx and Friedrich Engels are rare examples of silks produced in the mid-1950's. 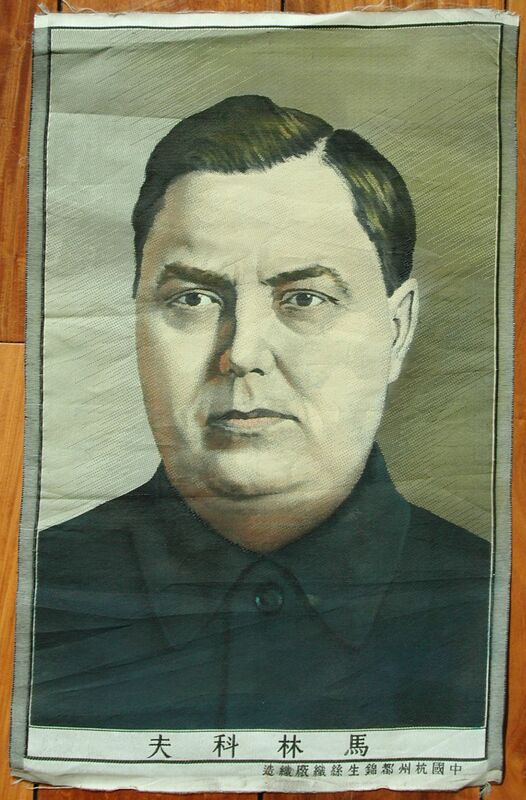 This is a most unique and rare silk in that it does not feature a Chinese leader, but rather the actual successor to Stalin in the USSR - Georgi Maksimilianovich Malenkov. It is simply a fantastic example that probably was produced somewhere between 1953 and 1955, during the short tenure of his premiership. Also showing it's age is the fact that traditional Chinese characters were used rather than the later developed simplified characters. This is the only one we have ever seen in 10 years in China! 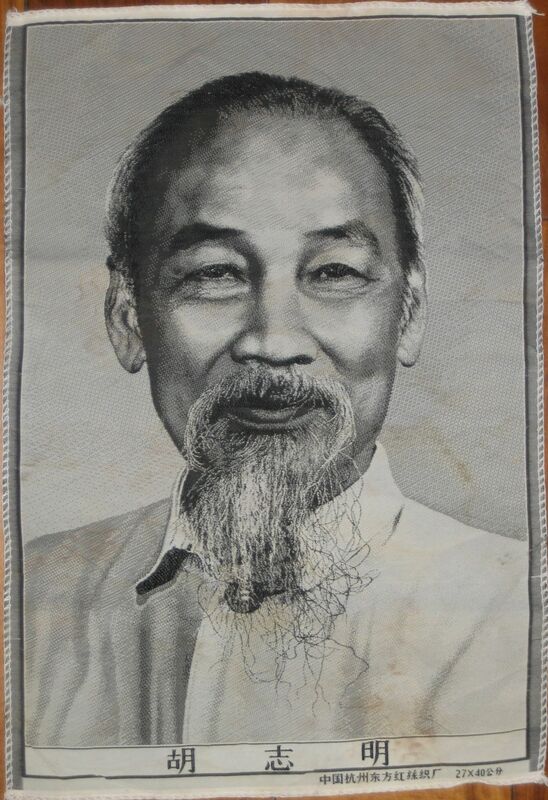 This is a Chinese produced silk portrait of Vietnamese leader, Ho Chi Min, president of North Vietnam from 1954 to 1969, and a great friend to the Chinese. 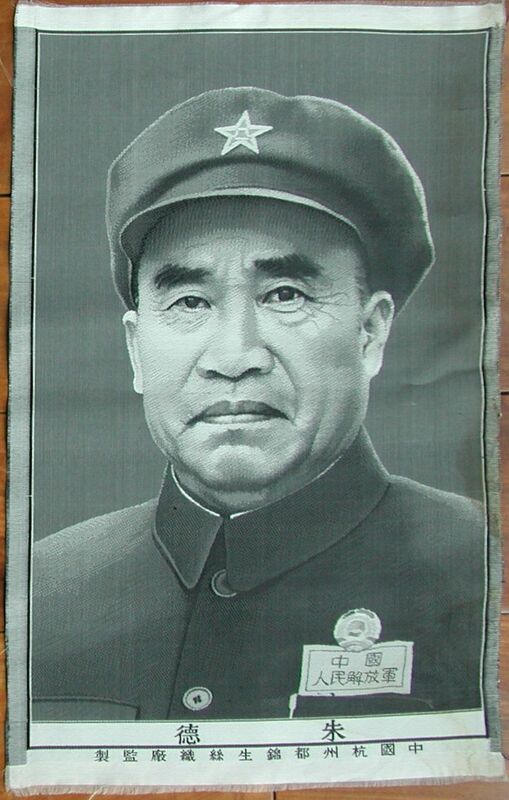 This is a Chinese produced silk portrait of the Chinese People's Liberation Army General Zhu De. 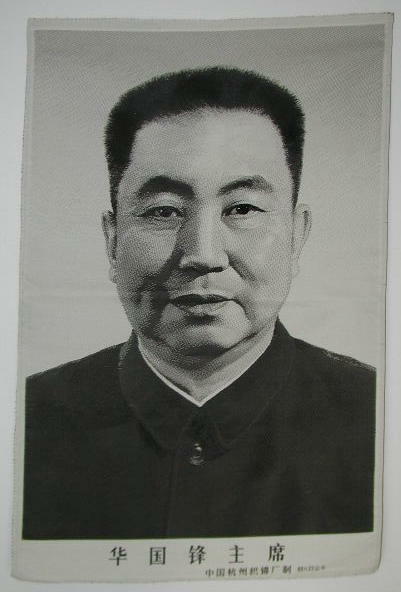 General Zhu was a comrade of Mao Tse-Tung during the Long March of the 1930's and managed to survive the purges of the Cultural Revolution. Attached to his uniform is the badge worn by Chinese 'volunteers' during the Korean War. 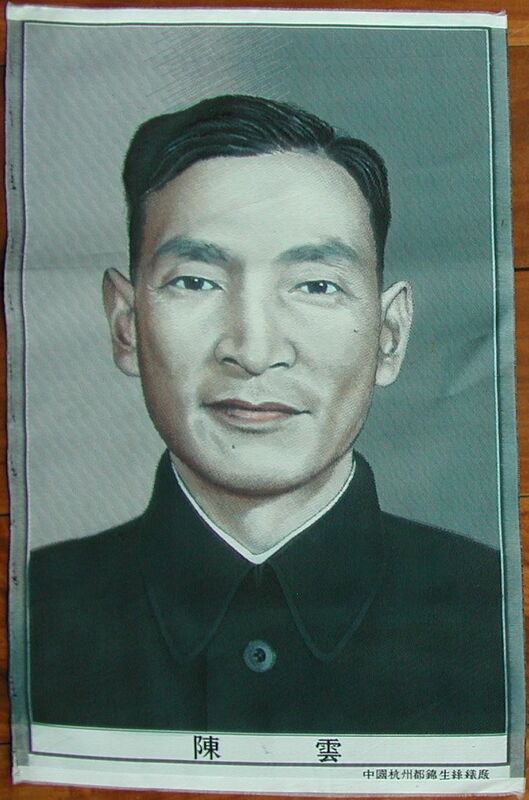 This is a hand painted Chinese produced silk portrait of the Chinese People's Liberation Army veteran Chen Yun. 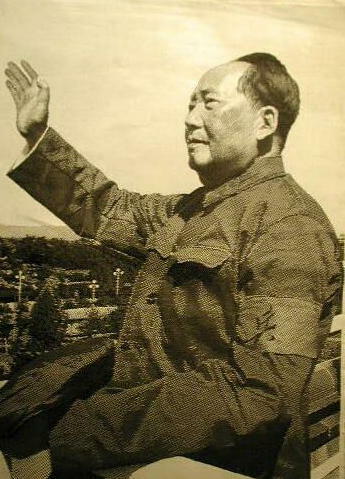 Chen Yun was a comrade of Mao Tse-Tung during the Long March of the 1930's, later in charge of financial and economic works, although he was purged during the Cultural Revolution and later rehabilitated. 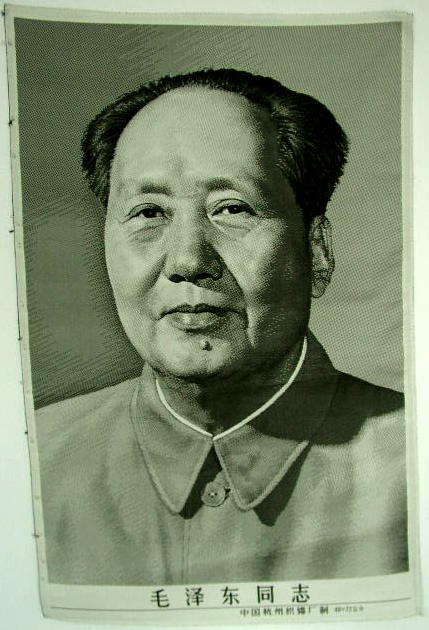 The "official" successor following Chairman Mao's death in 1976. 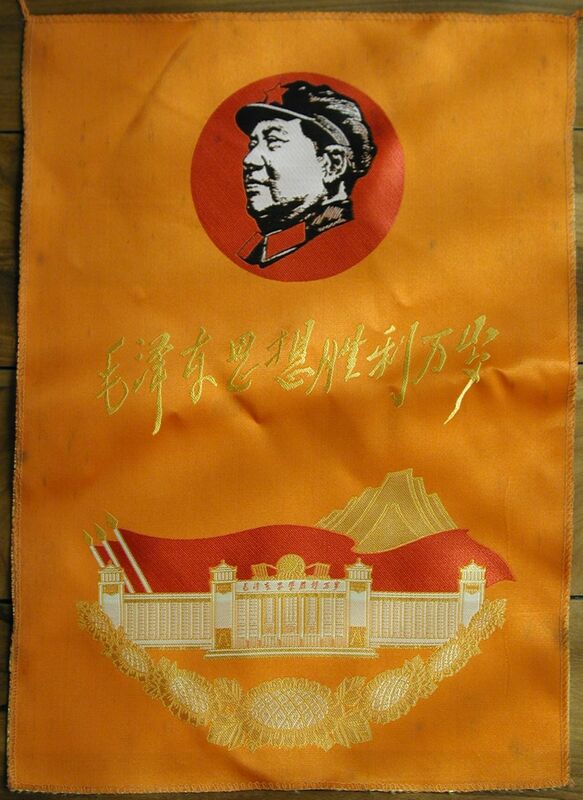 Deng Xiaoping soon took over the top spot, but not before Hua's silk portrait was made. A wonderful painted silk provided to readers of Evergreen Magazine. Size not marked, 27 cm x 40 cm. This is a fantastic silk brocade using several different colored silk threads. Under the portrait of Chairman Mao (sporting his uniform) are the words, 'Long Live the Victory of Mao Tse-Tung Thought', under which is the Great Hall of the People in Beijing. 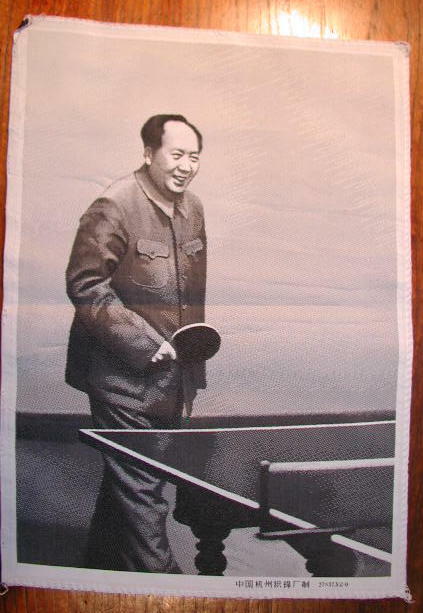 A nice small silk of Chairman Mao relaxing playing ping pong. Size is 27 cm x 37.5, made in Hangzhou in Southern China. 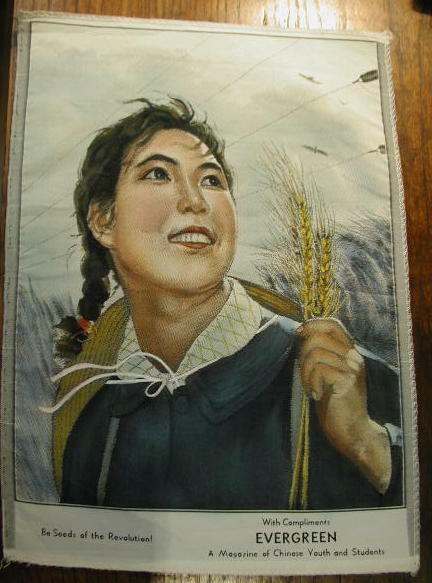 This is a classic picture from the Cultural Revolution made into a silk brocade.